Today I will take the stage at the GMA Consumer Complaints Conference in San Francisco. 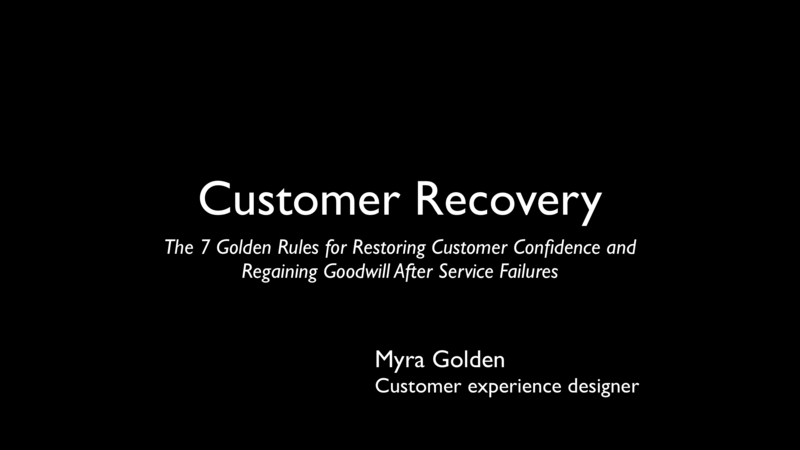 I created this very special keynote to help GMA member companies completely restore customer confidence and regain goodwill after the worst has happened. For the reference of my audience and for you, my blog readers, I am posting my slides from this presentation right here on my blog. Download your copy of my handouts now. Enjoy. Learn. Share. Myra Golden runs Myra Golden Media, a customer experience design agency that specializes in helping brands create the best possible customer experience throughout all contact channels. Myra has designed customer experience platforms for such companies as Verizon Business, McDonald’s, Coca-Cola, National Car Rental, Michelin Tires and Frito Lay. She has been named one of the Top 10 Customer Service Bloggers and she is co-author of Beyond WOW! The Service Leadership Approach to Exceptional Customer Service.